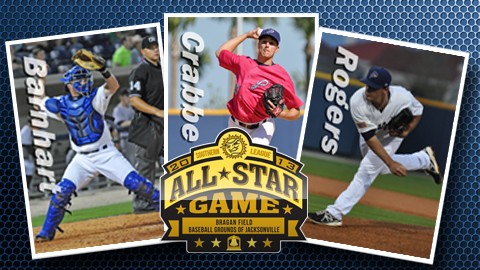 Three Pensacola Blue Wahoos have been named to the Southern League All-Star game, as announced today by Southern League President Lori Webb. Starting pitchers Tim Crabbe and Chad Rogers will join the South Division pitching staff while Tucker Barnhart was named to the team as a catcher for the game to be played at the Baseball Grounds of Jacksonville on July 17. The starting lineup for the South Division will be named on Friday. "We're really proud of our All-Stars," said Blue Wahoos Executive Vice President Jonathan Griffith. "We are very appreciative of the Reds for sending us some of the most elite players in Minor League Baseball. We know these guys will do a fine job to represent not only the Cincinnati organization but also Pensacola in Jacksonville at this year's All-Star Game." Crabbe, 25, has posted a 3-6 record with a 3.53 ERA in 16 appearances for Pensacola this season as of July 3. He's recorded four quality starts this season and got off to a strong start, going 1-1 with a 2.93 ERA in the month of April. As of July 3, Crabbe has the fifth-best BB/9 innings ratio, allowing just 2.2 walks per nine innings pitched. This is the first selection to any MiLB All-Star Game for Crabbe, who was a 14th round selection out of Westmont (CA) College in 2009 and is now in his fifth professional season. Rogers, 23, has anchored the Pensacola starting rotation while going 3-2 with a 2.20 ERA in 13 starts as of July 3. Despite missing three weeks in June with a right wrist sprain, Rogers ranks third in the league in ERA, third in WHIP (1.05), third in opponents batting average (.193), and second in baserunners allowed per nine innings pitched (9.56). Rogers was the Reds' Minor League Pitcher of the Month in April as he went 2-0 with a 1.82 ERA in the season's first month. This is the second straight year that Rogers has been named an All-Star, he was named to the California League squad in 2012. He was also donned a MiLB.com organizational All-Star after last season. Rogers was drafted in the 28th round out of Galveston Junior College in 2010 and is now in his third professional season. Barnhart, 22, has been the rock behind the plate for Pensacola, starting in 61 games as the Blue Wahoos' catcher and hitting .256 with two homers and 23 RBI. The switch-hitter's best month came in May when he hit .284 with a homer and 11 runs driven. His other home run came on Opening Day against Tennessee with his solo shot bouncing off the batters' eye in center field at Pensacola Bayfront Stadium. This will be Barnhart's first appearance in a professional All-Star Game, but he was named an MiLB.com organizational All-Star after last season. Barnhart was the Reds' 10th round draft in 2009 out of Brownsburg (IN) High School and is now in his fifth professional season. Barnhart is currently on the disabled list with a left hamstring strain, but he could be activated by the break. Players were selected by a vote of Southern League field managers, radio broadcasters, general mangers and print media. More players could possibly be added to the team at a later date due to promotions or injuries. The Southern League announced on Thursday that RHP Josh Smith has been added to the South Division's roster for the 2013 Southern League All-Star Game to be played on July 17 at the Baseball Grounds of Jacksonville. Smith joins Tucker Barnhart, Tim Crabbe and Chad Rogers on the squad. Rogers is unable to participate due to his recent promotion to Triple-A Louisville. This will be the second professional All-Star Game for Smith who was named a Midwest League All-Star in 2011. He was also a MiLB.com organization All-Star after the 2011 campaign with Dayton. Smith, 25, has posted eight quality starts with an ERA of 3.47 to go along with a 7-6 record. The seven wins is tops on the team as are his 83 strikeouts, which ranks third in the Southern League. Smith is in his fourth professional season after being drafted in the 21st round in 2010 by the Reds out of Lipscomb University. The coronation as an All-Star continues an amazing journey for the right-hander who was originally drafted in the 32nd round of the 2008 draft by the Philadelphia Phillies, but was released after Spring Training. Ellis bounced through three independent leagues before not participating in professional baseball in 2012. He was signed as minor league free agent in January and started the season in extended Spring Training before being assigned to Pensacola on April 16. With Pensacola, Ellis made his first 11 appearances out of the bullpen before moving to the rotation on May 29 with the injury to Chad Rogers. Once Rogers returned, Ellis was sent back to a relief role but has since moved back into the rotation with Rogers' promotion to Triple-A. As a starter this year, Ellis is 2-0 with a 1.80 ERA in six starts. Overall, Ellis is 3-1 with a 3.21 ERA in 20 appearances. He is Pensacola's probable start for the series opener in Montgomery on Wednesday.